Awaken to the sight of morning glories and roses growing from the corners of your nine foot-tall ceilings. This suite, on the main floor of our Coeur d’Alene Hotel, offers two large windows in each room, which lends to great natural light. Beautiful antiques and appointments enhance this elegant two- bedroom suite. 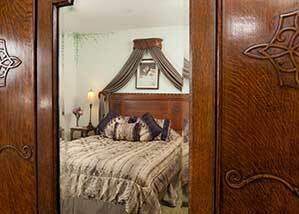 Great for families or friends traveling together, each bedroom has a queen size bed and door for privacy. A small foyer connects the two rooms, and a single bathroom with shower complete this suite.